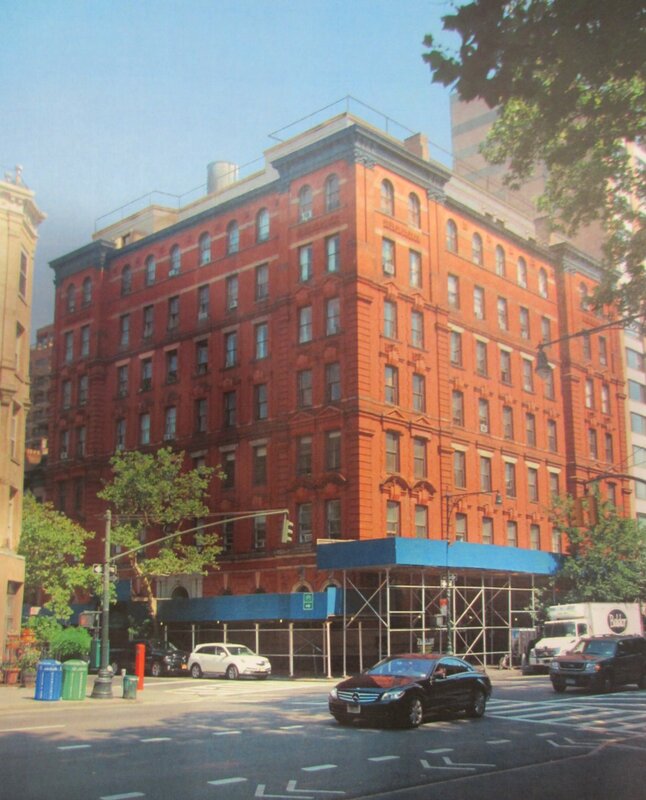 Rendering of the proposed two-story addition at 101 West 78th Street, Manhattan. Image Credit: Montroy Andersen DeMarco. Applicants testified that seven-story building was originally conceived as rising to nine stories, and that a two-story addition was approved in the 1890s. The Landmarks Preservation Commission considered an application to construct a two-story plus bulkhead addition atop the Evelyn, an apartment building at 101 West 78th Street in the Upper West Side/Central Park West Historic District, on July 23, 2013. The 1886 seven-story Renaissance Revival apartment building stands at the corner of Columbus Avenue, across the street from the American Museum of Natural History. The proposal also included the installation of an access lift at the main residential entrance, which would necessitate the removal of some historic fabric. The proposed addition would be clad in zinc, while a brick bulkhead would rise an additional story. Glass railings would surround the accessible rooftop areas. Portions of the addition would be visible from multiple viewpoints from public thoroughfares. Margaret Streicker Porres, President of Newcastle Realty Services, which recently purchased the property, further emphasized that the addition “mimics the original intention” for the building. She said the addition would be used for a residential apartment. Architect Richard DeMarco of the firm Montroy Andersen Demarco said the additional stories would have floor-to-ceiling heights of ten feet, six inches The first added story would have a floor area of 7,500 square feet, while the second added floor would be 2,800 square feet. Higgins responded to testimony objecting to the design by saying that sheet metal was common material for the facades of additions in the late 19th century. Commissioner Michael Goldblum said the Evelyn was a “very important building to the district,” and that the proposal was a long way from being approvable. Goldblum criticized the presentation for failing to show all sightlines from which the addition would be visible, and found the second story of the addition and the prominent bulkhead problematic. Commissioner Roberta Washington found the visibility of the proposal needed to be greatly reduced, and that the plan would probably need to discard the second story of the addition and the bulkhead. Commissioner Fred Bland also determined that any addition needed to be less visible and further set back from the front facade. Bland suggested that a mansard roof might be a more appropriate form for an addition to the Evelyn. Chair Robert B. Tierney concurred with the commissioners’ statements, and asked the applicants to substantially rethink the plan before returning to Landmarks with a revised proposal at a later date. LPC: 101 West 78th Street, Manhattan (14-4161) (July 23, 2013) (Architect: Montroy Andersen DeMarco).